PNW District Optimist Clubs: The Awards Hotline is here! The Awards Hotline is here! Congratulations to Ed Murphy III, Immediate Past Governor, for earning the Distinguished Governor award for leadership in the Pacific Northwest District for 2010-2011. (Front Page) Please click to read the full report. 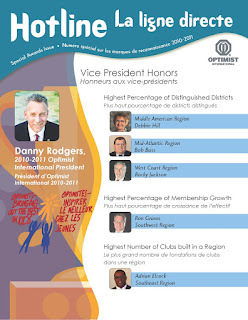 Rocky Jackson, Immediate Past Vice President of the West Region - Optimist International, earned Vice President Honors for highest percentage of Distinguished Districts. Congratulations to all for the outstanding achievements earned on behalf of our members and clubs. Because of your dedication we are able to share our vision for "bringing out the best in kids" throughout our communities.